A lot of companies love having an opportunity to show off their expertise, knowledge, and authority within their industry. Here at European Springs, we&apos;re no different! We really love to show off, especially when it comes to showing you all what we are capable of. 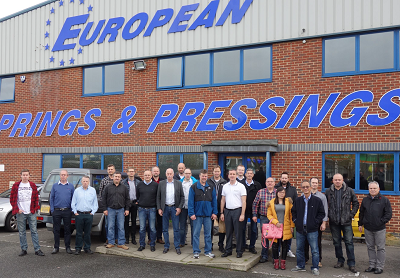 A few weeks ago, various springs manufacturers from across the world came to London for a conference meeting, and then afterwards, arrived at European Springs for a tour, talk, and demonstration of our skills. Here are the highlights of what happened. During the meeting that took place at the European Springs and Pressings manufacturing site in London, the Technical Director of European Springs, Howard Downs, presented a customer project that was initiated during last year&apos;s meeting. The project itself was, in fact, a customer request for a secateurs springs that a client, Stumpp and Schule, had received. It was appreciated in the European Springs community, and therefore have developed prototypes of these springs and met with the end client, which was Bosch, the engineering and electrics company. The reason why this was noted is because the secateurs spring, according to the rest of the meeting attendees, was actually the first one that was produced in the Lesjofors group; a magnificent achievement that showed willingness, dedication, and engineering expertise. After Howard Downs talked about the customer project to the attendees, Peter Bodilly, part of the Production Team at European Springs, discussed a tool that is used in the Lesjofors AB group that is used to check nearest corresponding standard known as the Spring Material Selector. The tool was created by the Institute of Spring Technology, also known as the IST, and it is used to manage other international standards if your material stock is according to a standard that is listed another country. The tool is a website and it is incredibly useful to manufacturing sites that are already exporting their products abroad but also want to widen their scope when it comes to the export industry. As such, the European Springs manufacturing sites at London and Cornwall would both benefit greatly from this tool, which could mean that the possibility of greater standards management is nearer to the horizon than we previously thought. The meeting was a complete success and we were extremely privileged to be a part of it. With the industry constantly changing and certain companies wanting even more requirements present, such as certain ISO certifications and the following of international standards, by complying to these, the manufacturing industry will, without a doubt, develop a much safer and environmentally friendly industry. As specialist spring manufacturers and experts in producing extremely high quality wire forms, we always want to make sure that the products that we manufacture are of the highest quality, which is why they always go through our intensive quality checks, to ensure that they are capable of being use in any situation. If you want to know more about springs and the industries that we supply to, make sure to contact us today and one of our incredibly friendly members of staff will be more than happy to help.